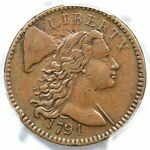 The Liberty Cap large cents of 1793-1796 are the classics of early American copper coinage. They represent the third step in the infant Philadelphia Mint's quest for a permanent cent design, succeeding the Chain and Wreath cents that began the new decimal coinage early in 1793. This third design was created by Joseph Wright, a New Jersey native and portraitist whose most famous works were his 1783 paintings of George and Martha Washington. In August 1793, Wright began work at the Mint as an engraver and die-sinker under the renowned scientist, Mint Director David Rittenhouse. Copper cents were still a novelty when Wright cut his dies. Most Americans had yet to see any of the new Federal coinage, still limited to cents and half cents. The citizens of the sprawling nation, only in its sixth year under the Constitution, thought in terms of Spanish milled dollars, state copper coins and private tokens (when they thought of coins at all). So it was most important that the public would accept the new cent, particularly since the Chain cent received such harsh reviews when first released. This criticism may have been on Wright's mind as he began his work. For the Liberty Cap cent, Wright drew inspiration from a popular design, French medalist Augustin Dupre's 1783 Libertas Americana Medal. This famous early American medal bore a youthful Liberty facing left, her hair unbound and flowing in the wind, superimposed on a pole topped by a pileus, the helmet-like emblem of freedom. Commemorating American victories at Saratoga and Yorktown, the medal was a private project of statesman-philosopher Benjamin Franklin and was distributed to many VIPs on both continents. It served its purpose well as a symbol of French support for the American cause. The roster of distinguished large cent researchers includes Sylvester S. Crosby, who published the first treatise on 1793 cents with J.N.T. Levick in 1869. Intense work on the 1794 cents began with Philadelphia's amiable Quaker, Doctor Edward Maris, who ultimately identified 52 varieties. Ongoing studies were made by such numismatists as Edouard Frossard, Thomas L. Elder, David Proskey and Howard R. Newcomb. The greatest modern large cent researcher was Dr. Sheldon, whose definitive Early American Cents was published in 1949 and revised in 1958 as Penny Whimsy with the aid of Dorothy Paschal and Walter Breen. "Sheldon numbers" are standard today for cents of 1793 through 1814. Sheldon lists four Liberty Cap cent varieties for 1793. For 1794, he recorded 56 "collectible" varieties plus several super-rare "Non-Collectibles." The 1795 cent varieties number only eight, including four lettered edge, three plain edge and one ultra-rare reeded edge coin. Plain edges were made necessary by reduction of planchet weight from 208 grains to 168 grains near the end of the year. This weight change was necessitated by an increase in the price of copper, which had reached a point where it cost the Mint $1.22 to produce one hundred cents. Sheldon's 1795 listing includes the controversial "Jefferson Head" cent with an unusual square-browed Liberty and pincer-like "crab claw" leaves in the wreath. Considering the ongoing efforts of some in Congress to replace the Mint with private contractors, many numismatists believe that these rare coins were privately struck as patterns for a coinage contract sought by Philadelphia saw-maker John Harper. The Wright design continued into early 1794, outliving its creator, who died during 1793's yellow fever outbreak without seeing any of his coins actually struck. 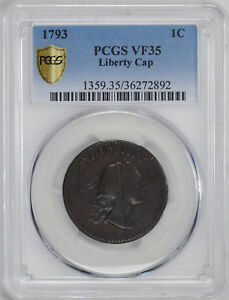 The Liberty Cap design was then modified by Robert Scot, another engraver brought to the Mint by Director Rittenhouse. These coins display a much lower relief. One unusual variety, the rarest in the series, is the Starred Reverse, bearing 94 tiny 5-pointed stars punched in around the reverse rim; another is the Missing Fraction Bar, which omits the line between 1 and 100 in the fraction. 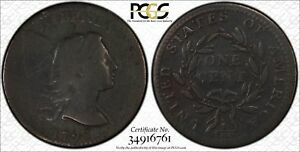 Most researchers attribute the dies used between December 1794 and April 1796 to John Smith Gardner, a general technician pressed into service to help meet demand for cents of the new thin-planchet type. Coins of May to June 1796 were struck from dies once again cut by Scot. In mid-1796, the Liberty Cap design was replaced by Scot's interpretation of Gilbert Stuart's Draped Bust motif, with its frumpy Liberty in a Grecian tunic without the cap and pole. 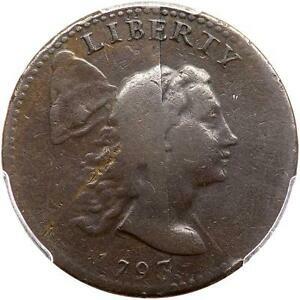 The Philadelphia Mint produced over 1.5 million Liberty Cap cents between 1793 and 1796. Most coins of this design encountered today range from Good to Very Fine. 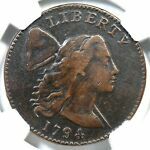 Coins from 1793 are the rarest, while coins dated 1795 and 1796 are the most readily available in high grade and are often sought by type collectors. Original red, mint luster is seldom seen, but natural patinas are very important in determining the coins' value, since copper can take on beautiful and stable surface colorations over the years. Variations in planchets, die preparation and striking make these coins challenging to grade, but generally the points of the design to first show wear are Liberty's hair at the forehead and above the ear. On the reverse, check the leaves next to the O and C in ONE. 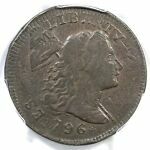 Obviously, higher grade coins are eagerly sought, but one must keep in mind that these coins circulated decades before Philadelphia's Joseph J. Mickley began his search for a cent of his birth year, 1799. Mickley was among the first to popularize coin collecting in this country. He was followed by many others, including America's first coin dealer, English-born Edward Cogan. 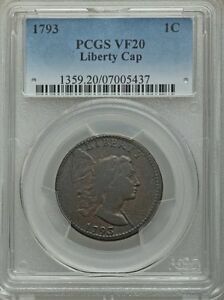 Cogan started his coin career late in life by supplying large cents to avid beginners in this new area of collecting. Noyes, William C. United States Large Cents, 1793-1814, published by the author, Monument Beach, CA, 1991. Sheldon, Dr. William H., Penny Whimsy, Revision of Early American Cents, Quarterman Publications (reprint), Lawrence, MA, 1976.